You can also agree that many Asian countries which have capitalist economies have made large investments in railway infrastructure, Hong Kong comes to mind as well as many cities in China. The neoliberal values in Australia, the U.S. and to a more limited extent in the U.K undermine their own values in that investment in PT makes an economy and business run more efficiently. Subsidising cars and investing in road infrastructure is also wasteful in regards to government spending (e.g. EW link) which is ironic considering these right wing governments boast that they are good at balancing budgets. I am in no way defending Labor in Victoria as their minimal investment in PT infrastructure was nearly as bad as the Liberals. Fascinating! A perspective I haven’t quite thought about before. But apart from some of the words used to present the ideas (so the flavouring of the ideas rather than their underlying merit), it is all basic and rational, and no different to what a rational person would advocate for PT on the basis of efficiency. Then again, “prudence”, long term stability and efficiency are supposed to be hallmarks of the old conservative paradigm. Most interesting is the way of phrasing the preference of rail over bus transit. That it is a “market” and the preference of the users is a sensible way of putting this, in terms of market-lead choice and demand. Completely changes my thoughts on approaches to buses of “(tell people to) put up with them” and “people will use them if good”. I ordered this book the yesterday ‘Great Railway Maps of the World’ by Mark Overden (the paperback edition). It still has not arrived in the mail yet. But thankyou for the book recommendation. There are some good quotes you have listed. We appreciate the review! Sorry to hear that you encounter the same ideological rigidity that we do here in the U.S. BTW, a limited number of copies of Moving Minds is available from The American Conservative Center for Public Transportation (founded by the late Paul Weyrich). Send us your address via e-mail ([email protected]) and we’ll be happy to forward a copy as long as our supply lasts. I think the bus v. rail argument is interesting. I wonder if it’s worth doing some research into how this played out in Wellington (NZ). The reason is that many routes in central Wellington, southern/eastern suburbs, and Karori are trolleybus routes – they have a pair of wires hanging above the street. This means that (in common with rail transport) there is a clear visual indicator of the route path. I also wonder how this plays out in Christchurch, Hobart, or any number of cities where there are no rail services (unlike Bogata, Christchurch does not have any particular designation of premium bus routes, but many bus routes do (did?) run frequently). It occurs to me that they should paint certain street kerbs orange, to indicate flagship bus routes. To me that’s just as important as actually improving the frequencies, and I would also like to see certain bus routes on the train map (as orange lines). Of course, some roads (eg Stud Road) have red bus lanes, so the orange kerb would be more appropriate where a bus lane doesn’t exist. A good review and it points out some subtleties of American culture. In many if not most places in the US a car is essential to get around and getting around by bus (if one is even available) is seen as a poor alternative only for those that cannot afford to have a car. Trains, subways, and light rail such as trolleys (trams in Australian) are generally not seen as a low class alternative in the way that busses are. The article also mentioned safety and it is indeed not safe to ride the bus through certain inner city “bad neighbourhoods”. Miami is one city that I would not ride the bus at night through the downtown areas. I lived in Miami for 16 years and I only rode a bus three or four times. Using the bus there it generally takes four times as long to get to where you are going and you are also likely to get soaked by the daily summer afternoon thunderstorms walking to and waiting for the bus. Whenever we had a hard rain (this is almost daily during the summer months) people I worked with who rode the bus would come into work soaking wet. As a conservative, much of this is unsurprising to me, although it’s good to see it published. A key point in all this discussion is that roads are subsidised by the government, which is hardly a free-enterprise outcome. I’ve been worried for some time that the environmentalists have held the floor with ideologically-based support for PT, giving conservatives little apparent reason to support PT. I agree with the claims about old technology /up to a point/, i.e. I don’t see the advantage in monorails, etc. As long as that argument is not taken too far. Modern technology has provided many efficiencies for PT, including vehicle tracking (for operations and public), signalling and control systems, improved maintenance, security (CCTV), etc. Surely the Federal government has explained its rationale? Isn’t it something like only funding nationally-important (or regionally-important?) transport rather than city-based transport? (Which makes some sort of sense being the national government.) They are willing, after all, to fund interstate rail, so it’s not a road vs. rail bias. I’m not saying that I agree with their stance, but I think there is at least a principle behind it rather than a “just because”. I think apparent permanence of route is an important point. Heavy rail/metro is rarely rerouted. Trams too, although Melbourne has made some changes, such as Batman Avenue. Buses are obviously at the other end of the spectrum. LIttle more than signage indicates bus routes in the field and that can easily be moved. Kiwi Nick mentioned trolley buses. They are between trams and buses—a bit more obvious and permanent than buses, but not as obvious nor as permanent as trams; how much effort does it take to move some wires, after all? It’s often said, as here, that building more roads doesn’t solve congestion, as traffic rises to meet (or exceed) capacity, with the implication that it’s a waste of time increasing road capacity. But it’s also said, as here, that ‘Figures show investment in transit results in more users. “If you build it, they will ride.” ‘. Isn’t that just saying the same thing in a more positive way? Don’t both modes have the same issue? Perhaps not, but it’s not explained why they are different. There are some claims cited from the book that are arguably not conservative ones: the reference to ‘peak oil’ and quoting opinions (first reference to p119) rather than just sticking with the facts. John, with regards to Federal Government funding (or lack thereof), the problem is that under the Constitution (as interpreted by the High Court), the state governments have very little ability to raise money themselves – they rely on the feds to give them the majority of their funds. The states can’t impose their own income taxes or sales taxes, and revenue from stamp duty, land tax and payroll tax (plus optional “taxes” such as gambling and traffic fines) is small change compared to the GST and income tax. We have this quite perverse situation where although the states are meant to be responsible for things like health, education and transport under the Constitution, they are hamstrung in delivering their own agendas on these issues because of the need for federal govt grants. So with the feds collecting the majority of taxes, and with 60% of Australians living in our 5 biggest cities, big city-based public transport projects are arguably of considerable national importance and worthy of fed govt funding – they’re certainly as significant as city-based road projects like East-West Link, which Abbott was prepared to hand over billions of dollars to help build (but he’s not prepared to help fund the Melb Metro Tunnel). So there clearly is a current bias in favour of road over PT (although I’m hoping a change in PM will change this – whether by way of change of Lib leader or by a change of govt next year). Another somewhat related issue is that conservatives have over the past 20 or so years demonised government borrowing and budget deficits, even though economists agree that its fine to borrow in times of need (provided the borrowings are used for projects that pass cost benefit analyses – which I note the Metro tunnel did but EW Link failed spectacularly). With interests rates so low, it’s crazy for Vic Labor to not borrow to build the Metro tunnel – crazy until you consider the unfair battering they would take from the Libs for borrowing and running a huge deficit. And yet, the Libs are prepared to sign the EW Link contracts which hand over millions/billions of dollars to private companies over 30 years, but with all risk retained by the state – how is this better than borrowing?!?. And to top it off, they provide a side letter guaranteeing the developers money for nothing if Labor cancelled the project! I wouldn’t have nearly as big an issue with conservatives if they actually were conservative in what they said and what they did, rather than the giant hypocrites we have in power now. @John, it is true that building more roads, and building more public transport both have traffic inducement effects. The crucial differences are that public transport has economies of scale, while roads have (some serious) diseconomies of scale. Safety: busy roads are unsafe, but busy trains are safer. Input Cost: beyond a point, busy roads have high marginal costs, but busy trains have low marginal costs. External Cost (hospitals, health, etc): busy roads impose high costs on society, but busy trains impose very little. On another note, the opinion of “old technology is king” needs some balance. John makes good points, to which I add the Internet as a way of distributing information about the system (and perhaps trip planners for navigating systems like Tokyo’s subway!). @John, to answer one of your questions… current Federal government policy on this seems to be largely driven by the PM, and his views are described in this excerpt from his book Battlelines. I think it’d be quite different if Malcolm Turnbull (who is often seen using PT) was in charge. Your point on technology was also well made. I suppose my own position might be to look at evolutionary, rather than revolutionary technology, which in trains for instance means better signalling, more efficient trains, more realtime information — rather than monorails and other tech which has few inherent advantages, but is often implied to be a good thing just because it’s different. I don’t accept your argument about state revenue, if for no other reason than the GST is revenue collected for the states by the federal government. GST is not a “federal govt grant”, and your comparison where you put GST+Income tax on the federal side is therefore flawed. Secondly, your comment that the situation is “perverse” because the states are responsible for things like health, education, and transport implies that the states are responsible for most services whilst the federal government gets most of the revenue. This overlooks the costs that the federal government is responsible for. Here are some ballpark figures: Victoria gets about $17 billion in its own taxes, plus about $12 billion in GST. That’s a total of about $29 billion. Victoria has a quarter of Australia’s population, so mulitiply that by four (i.e. = $116 billion) for a fair comparison with just one federal cost: social security and welfare, which costs around $131 billion. So to suggest that the federal government gets a disproportionate amount of income to the point of being “perverse” is not borne out by the facts. When I did economics, the first thing they taught us is that economists never agree, so to claim blandly that “economists agree that its fine to borrow in times of need” is suspect right from the start. The prudent thing is to live within your means, so of course budget deficits should be “demonised”. And don’t forget that borrowing means that some of your income goes to simply paying interest, not on productive results. I’m not defending your other criticisms, and in fact “conservative” governments in Australia tend to be “conservative” in the sense that they are marginally closer to that side of the spectrum than non-conservative governments, so I tend to agree with your last comment. I don’t dispute your first point, but my point was that the claim is often made that increasing road capacity doesn’t solve the congestion problem as though that was something that only applies to roads. Having said that, I think unfortunately that roads often enjoy economies of scale. Compare, for example, how many new roads are built compared to rail, or how many (very expensive) signalling systems are installed compared to road traffic signals. Also, it’s claimed, probably correctly, that busy roads are safer than less-busy roads, as traffic is slowed. However, despite that, it remains true that rail is much safer. You might be right about Abbott, unfortunately. And yes, Turnbull might well be different. The catch is that Liberals see Turnbull as Labor-lite, and see little point in supporting the party with him in charge. I have a video, which I might call “Forty Nine Seconds of Tony Abbott being Wrong” (not yet uploaded anywhere) – it takes that long for people to alight from the 902 bus at Nunawading station in the morning. The first is that borrowing for infrastructure is not living within your means. Corporations do it, home owners do it, but especially, governments do it and have been for decades. Borrowing or no borrowing is often an argument between different economic philosophies, but not the point here. Such borrowing is usually through infrastructure bonds, that funds things that return positively to the economy, and the positive dividend provides a useful service to the community, and pays for the cost of the interest on the loans/bonds. And if you don’t set it up stupidly, it doesn’t count against government budget deficits (such as NBN), because it isn’t an “on book” debt, but something to pay for that particular project. (Of course, the current PPP model breaks this, and the government pays for a corporation to service their debt PLUS pays them a profit on top of that, which is completely retarded; it only works if the private project receives no government funding, but then the community still pays through higher fees or tolls, so it isn’t great for natural monopoly things.) This is in opposition to governments booking budget deficits through borrowing required to fund recurrent spending such as on normal health, education, defence, etc spending. 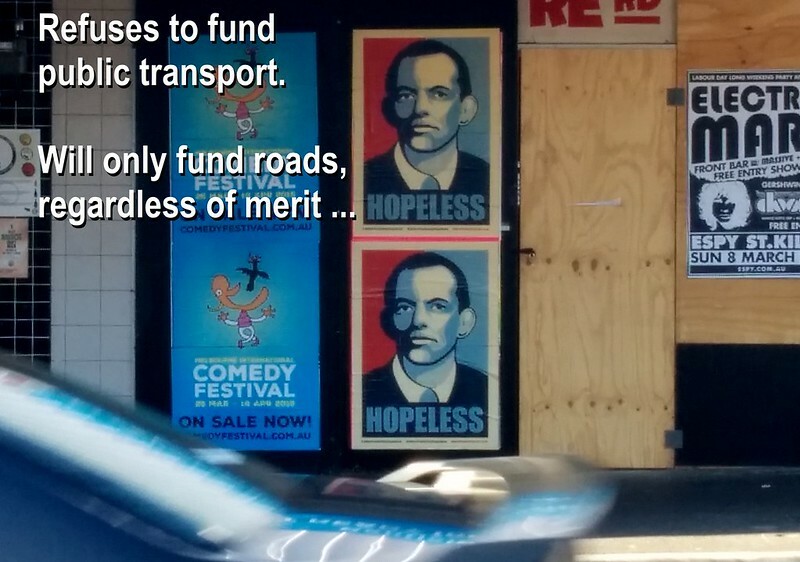 And on Tony’s take on PT/mass transit not being worth (federal) government funding, I don’t think it comes from a sensible philosophy of only supporting projects that are “nation-wide” in the way you describe (that would be a ‘sensible’ way of putting it). He has never said it in a sensible way like that, that I have heard, anyway. Instead it seems to be purely a dislike for urban rail and PT systems, because they’re seen as something akin to “socialism” and/or supporting the poor (which seems to be a refrain of this government, against people doing it harder, which is their strange ideological bent, and nothing to do with conservative politics per se, or even “economic rationalism” either). It just seems to be what he believes, against any practical evidence. And most of East-West Link is sold to urban car commuters (“the voters”), it has barely been sold on freight or interstate commerce terms. What he has said is that he ‘doesn’t believe’ enough people travel from one A to another B for mass transit to ever make sense, which is weird because Sydney has a massive rail and bus network, that’s full in peak (I believe), and so does Melbourne, especially our trams and trains, and yet practical evidence, let alone studies and theory, don’t seem to count. That’s an interesting one. Placating nimby’s ? I’d like to see a cost-benefit analysis of the cost of placating wheelchair advocates, compared to alternative possible courses of action. The key word you are missing the significance of, in Abbott’s quote, is the word “mostly”. Most people are not CBD commuters, even in the major cities. And even fewer people actually live in old inner-city neighbourhoods where their idea of a far-away place to visit, is two suburbs away. I travel around our cities a lot, and often spend 2 hours getting to somewhere that would take 20 minutes or less if I had a car. Most people don’t have the time. It is only slow due to lack of signal priority, dedicated lanes and poor maintenance of infrastructure. In an urban environment public transport can be significantly quicker than taking a car especially if you factor in congestion and time spent searching for parking. Someone should tell Tony Abbott that while taxpayers fund his private Limousine which does not cost him anything, ordinary taxpayers have to pay for fuel, rego, insurance, tolls parking and depreciation. This can be 5 times more expensive than a public transport ticket. Again not reliable because of poor maintenance and lack of capacity enhancing infrastructure which he is refusing to fund. I don’t see how all those roads, parking, accidents, health and pollution costs are not a much bigger drain on the public purse. Public transport will help reduce these public costs not the other way around. just look at the overcrowding on the Dandenong corridor and the trams in the CBD. My comment about borrow was rather simplistic, but then it was said to counter another rather simplistic comment! Yes, corporations, home owners, and governments do do it, but that doesn’t make it a good idea. In some cultures, I believe, a couple getting married will be given money by their extended family to buy their home, and thus avoid borrowing. And I know of at least one large corporation that never borrowed, on principle, and it didn’t restrict them. I’m not suggesting a case can never be made for borrowing, but in some respects borrowing is done because of impatience, not wanting to wait until the money is saved up. With home owners their may be little other option, but not always. If businesses can show that they can make more money by borrowing than not, they probably have a case too, but there are many small businesses that borrow to get started, then find the income is not there, and go bust. And governments have lots of money; there should be little need to borrow other than wanting to promise something NOW in order to get re-elected. If they really could get a good return on borrowing (say borrowing to build a toll road then recouping the money from tolls) it might be a good idea, but in practice governments often borrow to build (whilst spending much other unnecessary money) with the return being from future taxes, i.e. not directly as a result of the investment. You say that the P.M. has never “said it in a sensible way like that”. Daniel’s Transport Sydney link says “Mr Abbott later clarified his statement, pointing out that his government would still fund freight rail and interstate transport, and that it was only commuter urban rail projects that he was referring to. On his side is the division of powers set out in the Australian constitution, where the Commonwealth government is responsible for freight and interstate transport, leaving state governments responsible for urban transport.” They go on to point out what they see as an inconsistency in that stance, but the point is that the P.M. apparently /has/ “said it in a sensible way like that” (well, /something/ like that). And yes, he may well see it as something akin to socialism, but if so, how does that gel with supporting freight rail? Was the East-West Link not really sold on freight or interstate commerce terms? I’m not talking about how it was sold to the voters, but how it was sold to the federal government. I agree with your point about there being enough people travelling from A to B for mass transit to make sense, and in that light I disagree with enno, assuming he is using the word “commuters” correctly, as someone travelling to and from work. If commuters were the only ones keeping mass transit busy, there would be hardly anyone travelling on public transport outside peak hours, but there is in fact many, many, people, with enough people in Melbourne now using the trains /on weekends/ to justify ten-minute services on some lines. It has nothing to with impatience we need infrastructure earlier rather than later not because of impatience but because this is what our modern economy requires at the present time not 20-30 years into the future. We need capital investment such as MM1, MM2, level crossing removals, tram extensions, procuring more rolling stock and bus improvements. The return on this infrastructure investment will outweigh the cost of borrowing especially for a government with a triple AAA rating. This is why we have BCR analysis to ensure the return is positive which the EW link is not. Hmm, Tony (Tones to his mates, right?) shouldn’t have been so bluntly ideological in his book. That he later clarified his comments is good, but I have a feeling that isn’t because that is what he meant or believes, but because someone (media advisor) suggested it was how it should be put. High quality is most definitely not high frequency, although it would be nice. I live in the depths of regional rail land, and as a regular commuter to Melbourne over a long period of time, including by car when I have to, it’s important for public transport to be comfortable, have features that will draw you away from the car, and be on time. I happily paid for a first class supplement card, but first class in the old V/Line rolling stock is laughable and now pretty much gone (it’s only the Warrnabool services that remain with the 1950-1980’s carriages). The only thing first class gets you is a slightly wider seat and a tray. Once the entire day consists of V/Locity units, the issues with timeliness and getting a seat rears their ugly heads. For example, V/Line seems utterly incapable of getting scheduled regional trains into Southern Cross on time. I don’t know if it’s because there are limits to the amount of running diesel engines that are allowed into the platforms at once, or if it’s just poor planning, either way, you can reliably tack a good 10-15 minutes onto any service prior to about 9.30 am. Going home, the issue is simply seat availability. Standing for say a 10 km journey is bad enough on suburban trains, but it’s really unacceptable for 1.5 hour journeys, which is common on the Geelong line until around the 6.40, or even sometimes the 7 pm service. If anyone tells me that Geelong is only an hour away, I live near the Waurn Ponds station, and the typical scheduled service duration is 1 hour and 25 minutes, and when you tack on V/Line time, it almost always takes over 1.5 hours. For lines like Geelong that have suburban levels of patronage, there should be suburban levels of frequency if there are to be no perks like first class or features that would draw you away from a car.